This great looking 1938 Chevy Custom Convertible was built by Harry Westergard in the late 1940’s for Sal Cacciola from Pittsburg CA. In 2009 James Bauwer send me some photos of an interesting grave stone he came across one day. 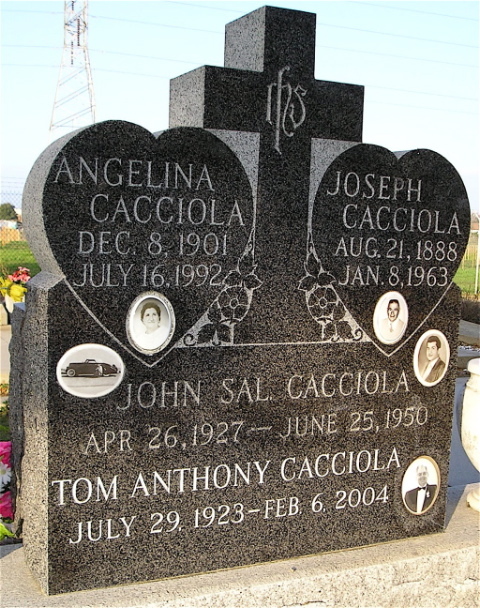 The photos he emailed me showed a very nicely customized 1938 Chevy apperently once owned by John Sal Cacciola who passed away in June 1950. It was the first time I heard about this car or the owner, I had no idea about its famous origins. 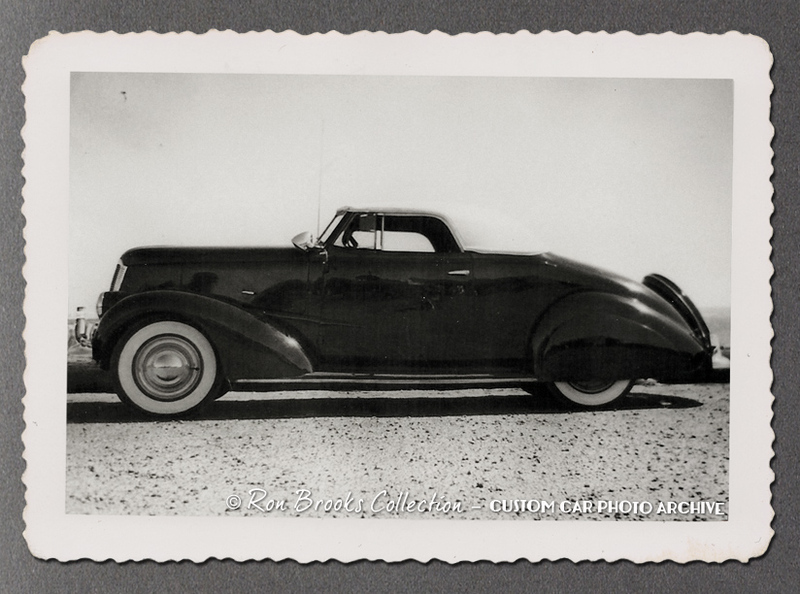 Three years later Ron Brooks send me a couple of 1940’s custom car photos and included were two photos of a 1938 Chevy convertible. I recognized it immediately and knew it had to be the same car as on the grace stone. Now I was intrigued. 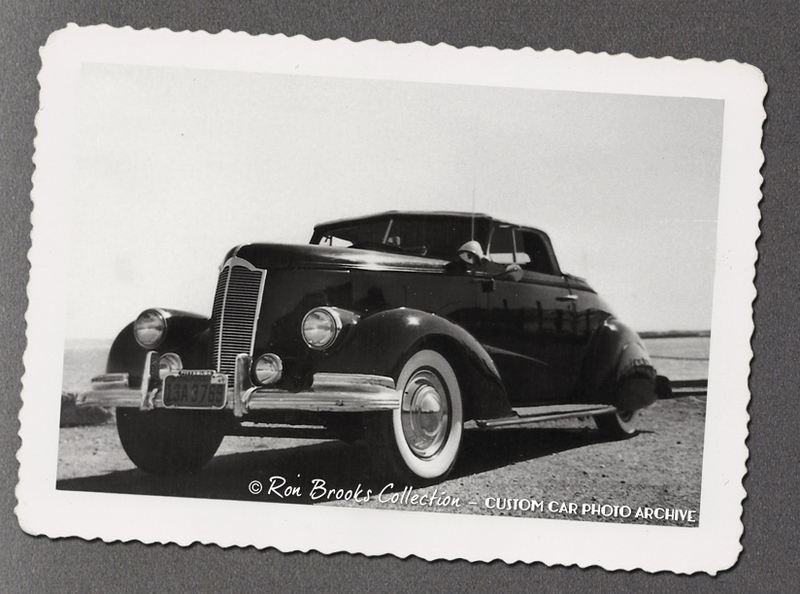 The only thing Ron knew about the car was that the photos came from the Pittsburg, CA. area. 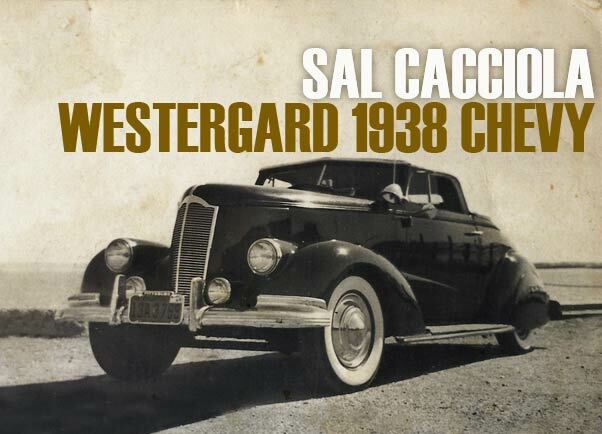 With this new material of this car and knowing were Sal had lived, I had a feeling the car could have been built by legendary customizer Harry Westergard. But at this time this remained only an hunch. 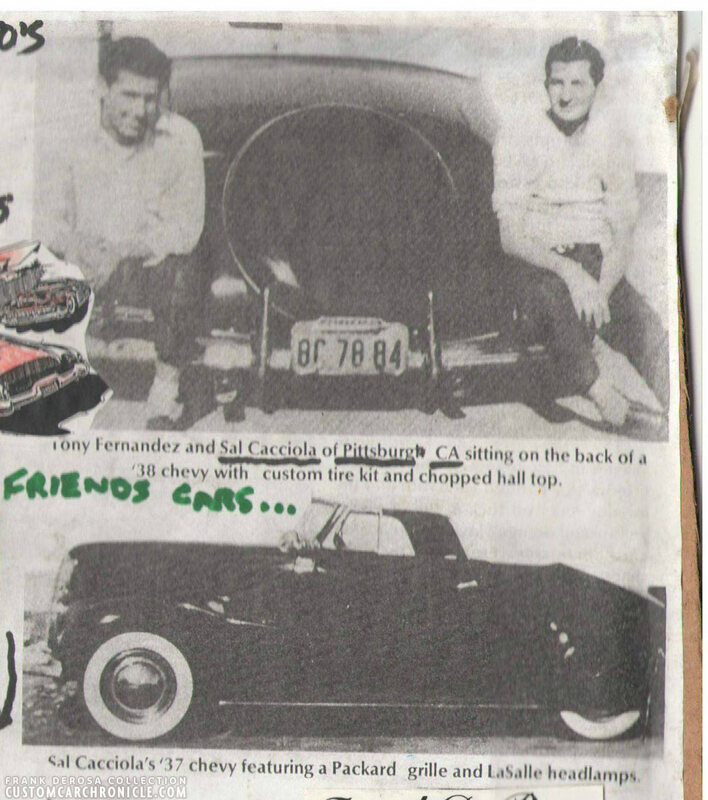 Frank DeRosa shared these three small snapshot he had of Sal’s 1938 Chevy with the CCC. I contacted Gina DeRosa (daughter of famous Custom Car builder Frank DeRosa) since I knew they came from that part of California. I asked if she could see if here father, Frank, could identify the car. A day later Gina confirmed my initial thoughts that this was indeed a Harry Westergard original. Frank DeRosa immediately recognized it as his old friends Sal Cacciola‘s 1938 Chevy. This was the first photo Ron Brooks shared and that got the whole identification process going. What an amazing photo. 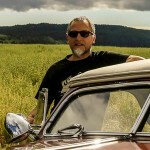 Frank De Rosa mentioned: In 1946 Sal took his 1938 Chevy Convertibleto Harry Westergard to have him built a unique custom in his well knows teardrop style. 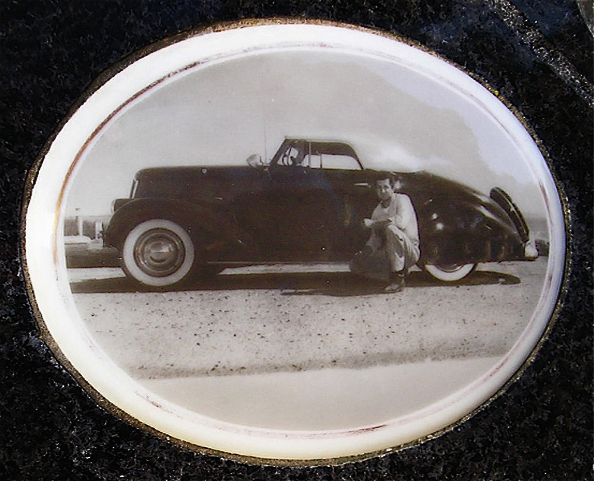 Harry modified the hood to accept a Packard grille, he made solid and smooth hood sides. A particular nice touch was when Westergard molded a set of 1940 Chevy headlights into the fenders which now visually extends the cowl/door character line all the way up to the grille. Westergard chopped the windshield and had Hall Tops of Oakland CA. create the padded top. Westergard installed the spotlights, the foglights and a set of 1941 Oldmobile bumpers which he apparently liked very much since he used them on several of his customs. The spare tire cover was repositioned, placed a bit lower and at a slightly steeper angle to flow better with the rear of the car. Profile photo shows the beautiful lines of the Chevy. The Chevy headlight line beautifully matches the Chevy character line on the cowl. Creating an optical fade away feel. The Tombstone photo James Bauwer send me in 2009 that shows Sal’s really great looking Chevy. At that point I thought it was a 1937 model. It was clear to me that not to long after that photo of Sal with his Custom Convertible he must have passed away. Sal’s Chevy as part of a collage in Frank De Rosa’s workshop. The sad story is that the owner of the car died in another custom car – a 1946 Cadillac – on June 25th 1950, while driving the Santa Cruz mountains. Frank DeRosa knew Sal very well, they where friends (and competed in creating the best looking custom in the area). Frank was at Sal’s funeral in 1950. We have no idea what happened to Franks wonderful Chevy since then. Sal’s family is looking to find the car, or more information about its current whereabouts. We have been in contact with the family, and sadly there is not much more known about the Chevy than what has been written in this article. Still we hope that one day they will be able to find some more photos of the car in the family photo albums. 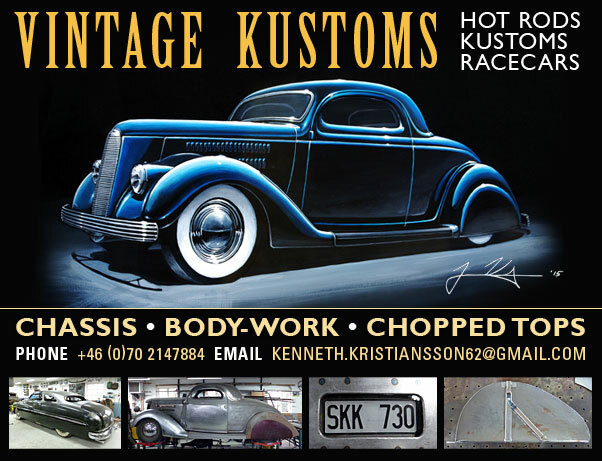 Or even better find out what ever happened to this wonderful Harry Westergard restyled 1938 Chevy. Wow Sal passed away young. Stunning Westergard kustom – my favorite style of Kustom. wow that’s nice. i know this an old thread but i’ve been looking through a lot of them lately and really is nice to see some non ford early customs. have to wonder how many westergaurd cars were built that we never got to see.